Bhattru and his team would arrive without fail to cook a grand feast for all occasions at my mother's place. 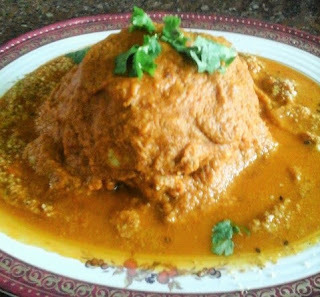 Preparations for the feast would start the previous evening itself when the whole atmosphere would be engulfed by the fragrance of the freshly prepared Saaru Pudi / Rasam powder. Bhattru was kind enough to give me the list of ingredients he used in the preparation of his special Saaru Pudi / Rasam Powder. I used Bhattru's list of spices to prepare my favourite Mysore Rasam. Combined with fresh coconut gratings it had a 'wow' effect! The fragrance it emanated was really mind blowing! 1. Wash the dal and add 2 cups of water and turmeric powder. 2. 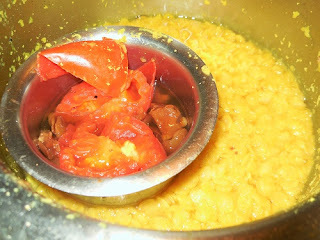 Add tamarind, half of the chopped tomatoes and water to a small cup and place it in a corner of the dal vessel. 3. Pressure cook until three whistles until the dal becomes mushy. 4. 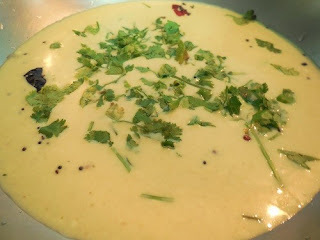 Heat oil in a pan and add Coriander seeds, Urad dal, Pepper, Fenugreek seeds, and Cumin seeds followed by red chillies. 5. Gently roast on low flame till the spices emanate a very pleasant aroma. 6. Add asafoetida and roast till it becomes flavoursome. 7. Add curry leaves and roast till it becomes crisp. 8. Let the roasted spices cool down. 9. Grind the roasted spices into a fine powder. 10. Continue to grind with fresh coconut gratings adding little water until it gets a chutney like consistency. 1. Take out the dal from the cooker and mash well. 2. Squeeze out the juice of the cooked tamarind and chopped tomatoes into the dal. 3. Add salt, the remaining chopped tomatoes and and the whole curry leaf twig. 4. Blend in the spice and coconut paste and bring it to a boil. 5. Add one glass of water and cook on low flame till the rasam becomes foamy. 6. Switch off before it boils over and garnish with coriander leaves. 7. 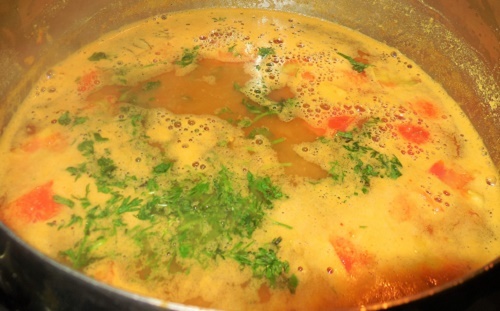 Heat ghee and splutter the mustard seeds and pour it over the flavoursome Mysore Rasam. This is a thick Rasam and the consistency is more like a thin version of Sambar. 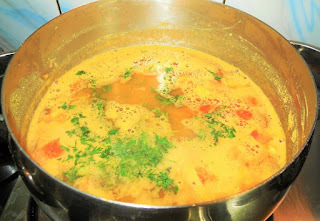 On days when I make Mysore Rasam we do not have Sambar or any other kozhambu for that matter. "Kalakkiyaa? Teluvaa? "is the usual question popped at you while Rasam is served. Kalakki means well stirred and Teluva is the clear and thin Rasam which stands on top of the Rasam vessel. Enjoy the well stirred Mysore Rasam or Kalakkina Mysore Rasam with hot rice topped with a spoon of fresh ghee. You are sure to be in the seventh heaven while savouring the delicacy! It is my habit to get the clicks of all the dishes I cook. 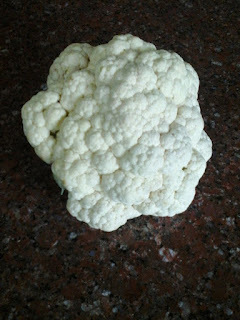 When I was casually browsing through my album the pictures of Whole Cauliflower Masala caught my eye. This was prepared for my dear grand daughter long time ago. I immediately posted the picture with a 'Can you guess the dish' caption in my Facebook page and I was amused by the diverse guesses that poured in. Here comes the recipe of WHOLE CAULIFLOWER MASALA! 1. Remove the leaves and the thick stem of Cauliflower taking care to keep the head intact. 2. Soak Cauliflower in warm water and salt for at least fifteen minutes. 3. Drain and wash thoroughly. 4. Steam the Cauliflower in a pressure cooker for about ten to fifteen minutes till it is just done. 5. Heat 1 tbsp of oil in a kadai and add the chopped ginger and garlic followed by chopped onion. 6. 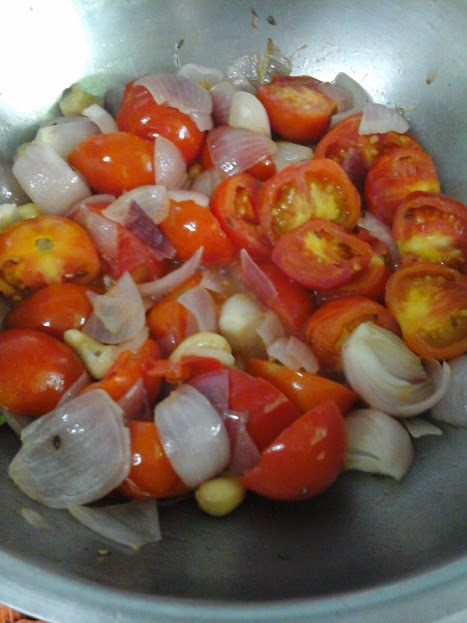 When the onion becomes transparent add chopped tomatoes and cashew nuts. 7. Cover and cook stirring now and then till the tomatoes are soft. 8. Allow the sauteed ingredients to cool and then grind them into a fine paste. 9. Heat the rest of the oil in the same kadai and add the cumin seeds. 10. Pour the ground masala into the kadai and add salt, sambar powder, sugar and the spice powder. 11. 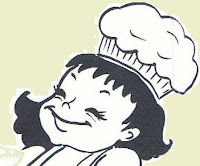 Cook till it emanates a very pleasant aroma. 12. Place the steamed Cauliflower with its head side immersed in the gravy. 13. Simmer for 2 minutes and flip it gently and allow to simmer for another minute before switching off flame. 14. Gently remove the Cauliflower into a serving dish. 15. 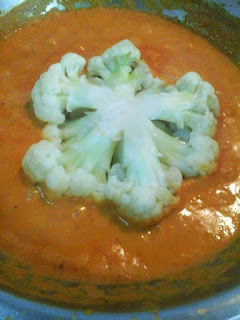 Pour the remaining masala gravy over the Cauliflower. Cut the Whole Cauliflower Masala as you would cut a cake using a sharp knife and enjoy it with plain rice, Jeera rice or rotis. Morkuzhambu (Curd/yogurt gravy) and Ama Vadais (Deep fried Bengal gram patties) are two of the indispensable dishes in all festival menus. Soaking some of the Vadais in Morkuzhambu has been an age old practice in almost all South Indian homes. Since Morkuzhambu Vadai has been our family favourite, the number of Vadais prepared during festivals were always two or even threefold! One portion of the Vadais were soaked in Morkuzhambu to be served during the feast. The other portion were served as they were. 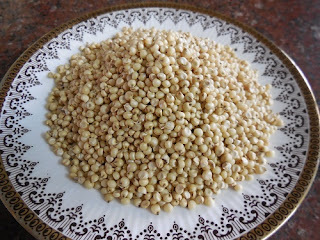 A third portion of Vadais were reserved to be used as coffee time/tea time snacks! 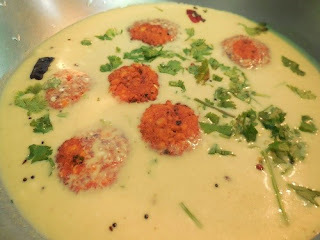 Here is a recipe for Morkuzhambu Vadai starting from scratch. 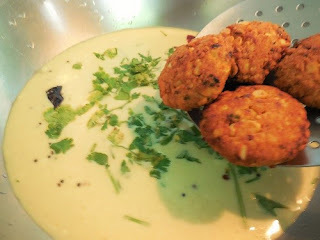 Since this post is exclusively about preparing Morkuzhambu Vadai I have used three lentils instead of the customary Bengal gram dal to prepare the Vadais. 1. Soak the three dals and red chillies for one hour. 2. Drain and grind them coarsely with ginger, salt and asafoetida without adding water. 3. Add curry leaves and run the mixer for a few more seconds. 4. Add fresh coconut gratings and blend for another two seconds. 5. Mix in the cumin seeds. Now the Vadai batter is ready to be fried. 1. 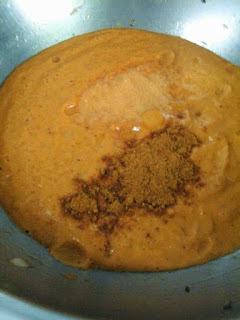 Blend the curd mixture and the ground paste together. 2. Heat sesame oil and splutter mustard seeds. 3. Add broken red chillies and fry till they become crisp. 4. Add the seasoning to the Morkuzhambu mix. 2. Put the vessel containing the Morkuzhambu mix on the second burner on low flame. 3. Take small balls of Vadai batter and pat them into small Vadais. 4. Gently slip them one by one into the hot oil. 5. 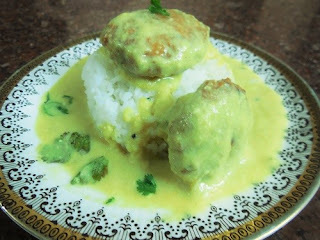 Cook till the Vadais become golden brown in colour flipping now and then. 6. When done drain the Vadais using a perforated ladle. 7. Add the drained Vadais to the Morkuzhambu and stir. 8. Fry all the Vadais batch by batch and drop them into the still cooking Morkuzhambu. 9. When the Morkuzhambu is about to boil over switch off flame. Enjoy the flavoursome MORKUZHAMBU VADAIS as they are OR relish with steaming hot rice. Morkuzhambu Vadai or Vadai Morkuzhambu is an excellent side dish to go with Puliogare and Vangibath. 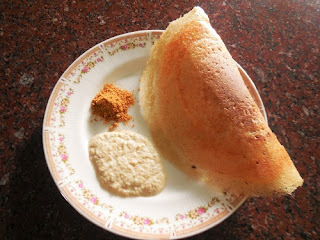 A breakfast at Hotel Ramavilas in Sathyamangalam was the topmost in our agenda during all our trips to South India. We enjoyed the drive through the cool forests of the Dhimbam ghats in the early hours of the morning.The sprawling greenery and a few wild animals spotted in the morning mist were feast to our eyes. As we descended via the 27 Hairpin Bends and drove towards Sathyamangalam we were in for another grand feast. This time it was a gastronomic feast at Hotel Ramavilas. The authentic and traditional breakfast was served in a simple but clean ambiance. The steaming hot Idlies, crisp golden Vadas, delicious Dosas, flavoursome Sambars and tasty Chutneys are still fresh in my memory. We arrived at the hotel quite early in the morning when pots full of freshly churned butter was being delivered at the hotel's doorstep, giving away the secret of the heavenly aroma that emanated from the kitchen. Yes! The aroma which permeated the entire atmosphere was that of fresh ghee made out of freshly churned organic butter supplied by the rustic milk maids. Those were the days when everything was naturally fresh and organic.We hungrily tucked in our tasty and flavoursome breakfast served on banana leaves with so much relish, that the leaves looked spotless and shiny even after we finished our breakfast! The golden Ghee Roast bursting with the aroma of fresh ghee was so thin, crisp and flavoursome that one could savour at least half a dozen of them at the same time! Sorghum/Cholam/Jola has a quality which makes the dosas naturally crisp. Cooking in ghee makes it even more crisp and flavoursome. Soaking Sorghum/Cholam/Jola for a long time makes it more nutritious and easily digestible. It also makes grinding easy. I used my table top grinder for the purpose.The end product kindled my nostalgia about the Nei Roasts that I had enjoyed as a small girl at Hotel Ramavilas long long ago. I hear that the hotel is still doing very well even after so many decades. 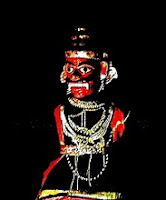 Anna Daataa Sukhi Bhava ! 1. Wash and soak Sorghum and black gram dal together for 5 hours. 2. Grind them together into a smooth batter adding water as required. 3. When the batter becomes smooth add salt and sugar and grind for another two to three minutes. 4. Allow the batter to ferment overnight. 5. The batter will rise by the morning. Add little water to the batter if it is too thick for spreading. 6. Dribble little sesame oil on the iron griddle and rub it thoroughly all over the surface using a cut onion. 7. The griddle/tava is ready for use if it makes a hissing sound when little water is sprinkled on it. 8. Pour a ladleful of the dosa batter in the center. 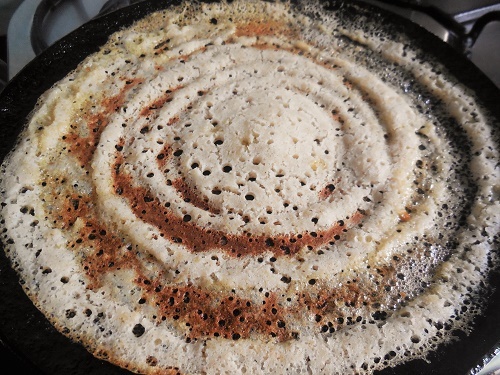 Spread the batter into a thin dosa using the back of the ladle using circular motions. 9. Dribble ghee liberally around the dosa, and brush some on the top as well. 10. 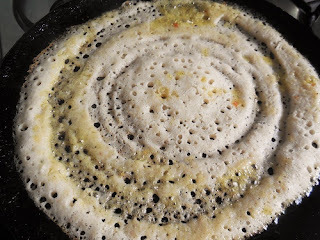 Reduce flame to medium heat and cook till a brown colour is visible through the lacy dosa. Gently fold and the remove the crisp and crunchy ghee roast using a spatula. Enjoy the flavoursome and crunchy Chola Maavu Nei Roast/ Jolada Hittina Tuppada Dosae with coconut chutney and 'gun powder'.